(Bloomberg Opinion) -- When companies book a massive writedown, shareholders often just shrug. That’s because impairments usually happen a long time after the market has formed a fairly accurate opinion of the company’s financial position – and a charge doesn’t impact cash. India’s Tata Motors Ltd hasn’t been so lucky in how its own writedown was received this week. The 3.1 billion pound ($4 billion) non-cash impairment booked by Jaguar Land Rover, its British subsidiary, helped wipe 18 percent off Tata Motors’ share price on Friday, bringing the decline over the past year to 60 percent. JLR was once Tata’s golden child, but the luster has faded as a laundry list of problems emerged. Demand for the company’s sedans and diesel vehicles is sagging, China sales are in a tailspin and Brexit might make everything a whole lot worse. While the U.K. carmaker is slashing thousands of jobs, it still has to invest in new vehicles and technology so it can compete with Audi, Mercedes, BMW and the like. JLR will shell out about 4 billion pounds this financial year on that effort, which includes a big push on electric cars. These spending commitments perhaps explain why investors didn’t like that historic impairment one bit. 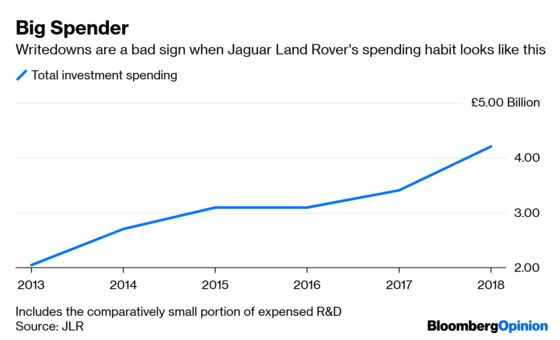 JLR’s writedown signals that previous spending splurges won’t deliver the hoped for financial returns. If that’s the case, then it’s reasonable for shareholders and bondholders to question whether the new investments will either. After all, the person in charge of capital allocation – chief executive Ralf Speth – hasn’t changed. Soon after Tata acquired Jaguar and Rover in 2008, the British business embarked on a massive spending spree. It has invested more than 20 billion pounds in plants, technology and developing new models since 2011. For a while, Speth’s efforts to make the brands more diverse and upscale appeared to be working wonders; revenues surged as customers lapped up expensive Chelsea tractors like the Range Rover. In hindsight, the company probably added more manufacturing capacity than was wise and tried to offer too many models, especially sedans. It helped, though, that comparatively little of its spending actually appeared on its profit and loss statement to begin with. Lately, higher depreciation charges have become more of a problem. JLR capitalized about 80 percent of its research and product development spending, a much higher figure than most other European carmakers (although similar to Aston Martin). That’s one reason why reported profits tended to be far higher than cash flow – often a warning of trouble ahead. Now, the writedown has closed some of that gap, but at the expense of wiping out most of the last three years’ net profit. The impairment helps in one respect: Future depreciation costs will be lower, helping profitability. But it erases almost one-third of JLR's net assets. That won’t help allay fears around its finances. 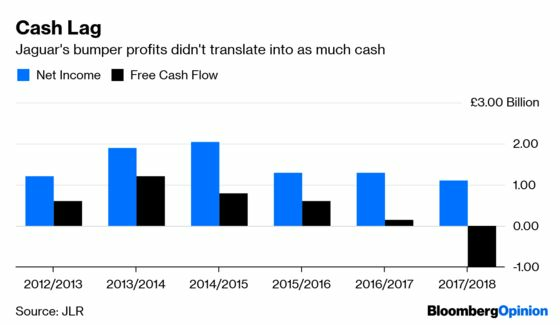 With diesel cars probably on the way out, and sticker prices under pressure in some countries, free cash flow will probably remain negative for at least the next couple of years. 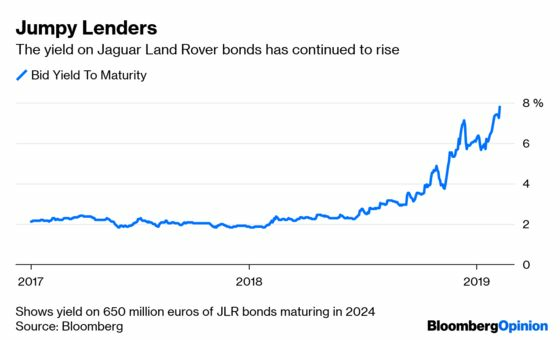 JLR has 4.4 billion pounds of cash and untapped credit facilities, but its 650 million euro of bonds maturing in 2024 yield 8 percent, which isn’t a sign of confidence. Speth has certainly had bad luck. Brexit and diesel’s rapid demise couldn’t have been foreseen. Even so, he’s the boss so he’s the one who carries the can.